The Republic of Cameroon is governed by a democratic multi-party system structured after the French. The Senate and even The Economic and Social Council. All government activities take place from the Yaounde, the political capital of Cameroon. President Barack Obama and First Lady Michelle Obama pose for a photo during a reception at the Metropolitan Museum in New York with, H.E. 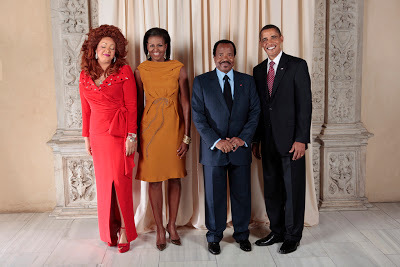 Paul Biya President of the Republic of Cameroon and his wife, Mrs. Chantal Biya, Wednesday, Sept. 23, 2009. (Official White House Photo by Lawrence Jackson) This official White House photograph is being made available only for publication by news organizations and/or for personal use printing by the subject(s) of the photograph. The photograph may not be manipulated in any way and may not be used in commercial or political materials, advertisements, emails, products, or promotions that in any way suggests approval or endorsement of the President, the First Family, or the White House. The ruling party, Cameroon People's Democratic Movement (CPDM) controls majority of the parliaments and ministerial positions. The CPDM is headed and Chaired by Mr. Paul Biya Cameroon's second and current president since 1982. There are over a hundred (100) of opposition parties in Cameroon and the major ones being, Social Democratic Front (SDF), Cameroonian Democratic Union (UDC), National Union for Democracy and Progress (UNDP), Union of Cameroonian Populations (UPC), Movement for the Defense of the Republic (MDR). Cameroon government is member to several international organization. Noteworthy amongst these are: United Nations and its subsidiary organizations, British Commonwealth of Nations and many others. The current flag of Cameroon is made up of three vertical strips: Green, Red and Yellow with a yellow Star in the middle of the Red band. There are over fifty (50) ministries with close to a hundred (100) ministers and minister delegates in the Cameroon governement. Here is a full list of Cameroon government Ministries, Minister delegates and ministers. Some of the ministers have been rotated but the offices remain the same. The current currency of Cameroon is the franc CFA. Learn more here about the History of Cameroon money, FCFA. Cameroon Embassy and Diplomatic Relations. The government of Cameroon currently has over 45 diplomatic embassies and consulate offices worldwide. A detailed listings of the contact info for Cameroon embassies is provided on the Cameroon Embassy page. As a foreigner visiting Cameroon would require a visa. Three visa categories are available: Cameroon Tourist Visa (including hunting), Cameroon Visitor Visa and Cameroon Business Visa. Check the Cameroon visa requirements and Cameroon visa applications forms to see which category suits you best. Cameroon has several national and religious and secular holidays. Check out the list provided and be sure to schedule your Cameroon business activities accordingly. Several banks do business in Cameroon. The World Bank supports many activities in the region. Many commercials are available for your business needs: Citi bank, Standard Chartered Bank, SCB Crédit Lyonnais du Cameroun bank and lots more.